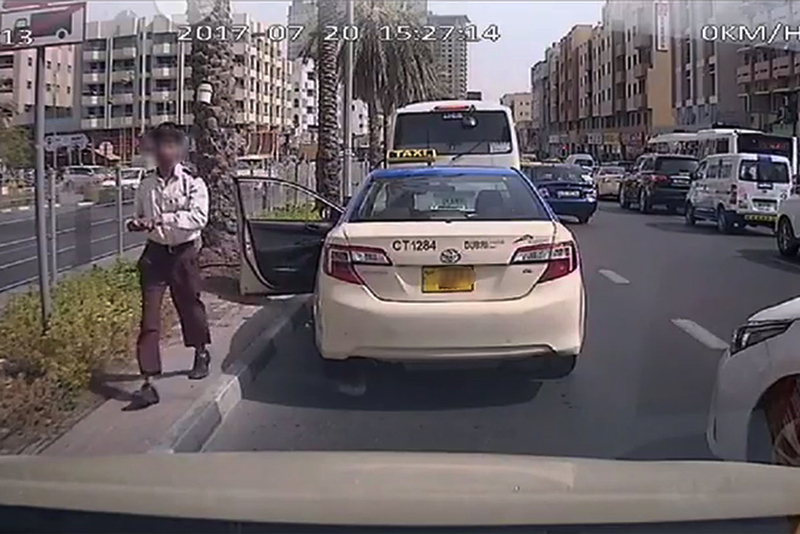 Dubai: A driver in Dubai was fired and had his taxi license revoked after a video showed him intentionally reversing, and crashing into another taxi. The video, which was uploaded on YouTube recently, shows the driver getting out of the car and arguing with another taxi driver behind him. The shouting gets louder and the driver gets back into his car, but shortly starts to slam the brakes several times. When the second taxi driver manages to avoid hitting the car, the first driver loses his temper and backs into the car. The Roads and Transport Authority (RTA) in Dubai confirmed that the driver was employed by a taxi company in the emirate, and deliberately hit another taxi by reversing into it. Further to what has been circulating in the social media; where a taxi driver of one of franchise companies in Dubai, has intentionally reversed to hit the vehicle behind, the RTA stresses that this is a sheer individual conduct on the part of the cab driver. The RTA shuns this sort of attitudes and other unruly conducts unfitting with the profile of the RTA in particular and Dubai Emirate in general. The RTA has therefore taken the appropriate action towards this incident by directing the concerned company to terminate the services of the driver and withdraw his permit as a taxi driver in the Emirate. The RTA stresses that the UAE community is governed by rules & legislations that address any outlawed behaviours in breach of the values and ethical practices prevailing in the country. Therefore, the RTA regrets this uncivilized behaviour and calls on all parties to comply with the civilized values. The RTA also apologised for inconvenience and uncivilised behaviour, and appealed to all members of the public to act respectfully on the roads.